Lalibela is a malaria-free Eastern Cape game reserve in South Africa with exceptional wildlife habitats creating unforgettable Big Five safari experiences for the whole family. There are no public roads through Lalibela Game Reserve and African wildlife like the Big Five, Lion, Rhino, Elephant, Buffalo, Leopard, roams freely throughout. 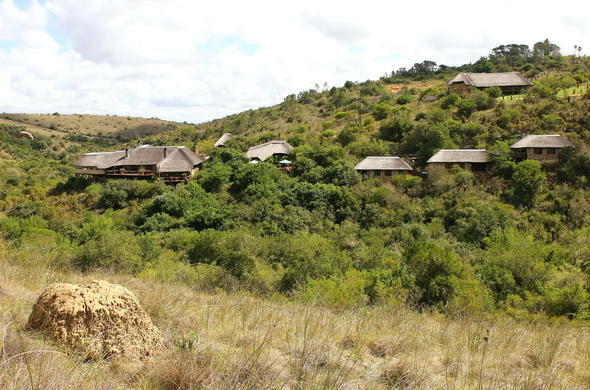 This Eastern Cape game reserve is easy to reach and perfect for conferences, weddings, family holidays and more. Lalibela Game Reserve is only and hour's drive from the “Friendly City', Port Elizabeth, which is also the gateway to the Garden Route. Visitors to this malaria-free Eastern Cape game reserve in South Africa can enjoy a Big Five safari before or after a tour along the famous Garden Route, without having to fly elsewhere. Lalibela Game Reserve offers family friendly safari accommodation and fantastic activities for children. Covering 7 500 hectares, this malaria-free Eastern Cape game reserve in South Africa comprises 5 different biomes. The valley bushveld biome occurs only in the Eastern Cape and has the highest carrying capacity of game in South Africa. Lalibela Game Reserve is therefore able to sustain a dense population of African wildlife. Big game sightings occur regularly and other game such as Zebra, Giraffe, Hippo, Cheetah and Hyena are abundant. Lalibela Game Reserve lies near Port Elizabeth and Addo National Park. Guests at this reserve can look forward to great comfort, service and delicious food at Mark's Camp, Tree Tops and Lentaba Lodge. Each option has a unique character and offers luxury accommodation with exclusive African and traditional Safari décor. Enjoy a romantic wedding at Lalibela Game Reserve near Port Elizabeth. The boma (outdoor enclosure) and conference centre can host functions and events for up to 120 guests. Wake up to an early morning game drive in an open vehicle with one of Lalibela Game Reserve's experienced game rangers to witness the wonderful array of game species such as the Giraffe.